Kelly Pratt leads wire-to-wire to win the 2011 B.A.S.S. 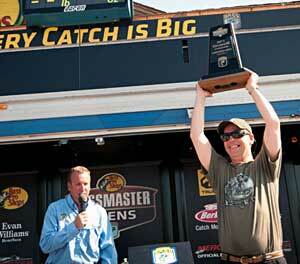 Northern Open on the James River and a spot in the 2012 Bassmaster Classic. Photo Credit: B.A.S.S. RICHMOND, Va. — Kelly Pratt was at a loss for words after winning the first Bass Pro Shops Bassmaster Northern Open on the James River. His three-day catch of 42-6 was good enough to best runner-up Randall Tharp by more than 5 pounds. “I can’t even describe this right now. It’s a dream come true,” he said. 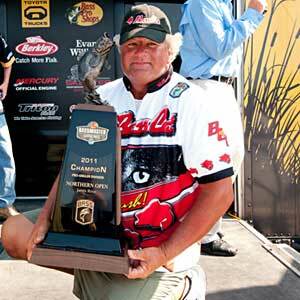 Though he’s excited about his Open win, Pratt is even more excited about the berth in the 2012 Bassmaster Classic he earned. Pratt caught most of his fish this week on a green pumpkin candy bug Zoom Finesse Worm rigged on a 1/8-ounce Slider Head. His best place the first two days was a log, but the bass had scattered from there on Day Three, meaning Pratt had to go find the 12-3 that he weighed today. Kelly Pratt leads wire-to-wire to win the 2011 B.A.S.S. Northern Open on the James River with 42-6 pounds of bass over three days. Photo Credit: B.A.S.S. Pratt also collected a cash prize and a brand new Triton/Mercury rig, for a total value of $53,867. 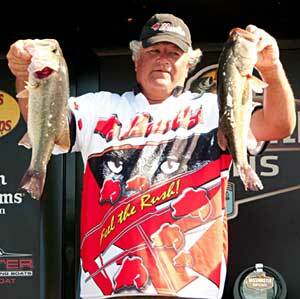 In second place is Randall Tharp of Gardendale, Ala. Tharp amassed 11-8 today for a total of 37-1. He had to decipher the tidal shifts of the James to claim runner-up. Most of Tharp’s fish fell for a black topwater frog, and others ate a junebug-colored Zoom Speed Worm. He had nearly 10 spots — all of which produced fish. He focused on lily pads as well as docks, one of which yielded his 6-6 on Day Two. He took home $13,300. In third place is Chris Daves of Spring Grove, Va., who caught 10-7 today for a total of 36-7; in fourth is Michael Iaconelli of Pitts Grove, N.J., who caught 8-13 for a total of 35-01; and in fifth place is Sean Wieda of Florence, Ky., who caught 9-1 today for a total of 33-8. Michael Rinaldi takes the 2011 B.A.S.S. Northern Open James River co-angler title. Photo Credit: B.A.S.S. On the co-angler side, Michael Rinaldi of North Haledon, N.J., took home a brand new Triton/Mercury rig valued at $35,000 for his total weight of 18-0. He caught 4-15 today. Rinaldi relied on a 4-inch Zoom Finesse Worm as well as a Zoom Speed Craw. In second place is Kevin Davenport of Richmond, Va., with 17-2; in third is Ike Rogers of Madison, Ala., with 15-7; in fourth is Lenny Baird of Stafford, Va., with 15-1; and in fifth place is Steve Duri of Hardy, Va., with 14-10. The next stop of the Bass Pro Shops Bassmaster Northern Opens is Lake Erie out of Sandusky, Ohio, Aug. 25-27, where another Classic berth will be awarded. The circuit wraps up in Syracuse, N.Y., on Oneida Lake, Sept. 22-24, where the third and final Classic berth will be awarded from the Northern Opens. Final results on the B.A.S.S. Forum - GreatLakesBass.com member Jon Jezierski takes 10th on the co-angler side.